The Bike Share 309 station at the corner of North Ave. at Broadway Ave. in Uptown Normal. The only bike share station on the Constitution Trail is located across from the Connie Link Amphitheater. 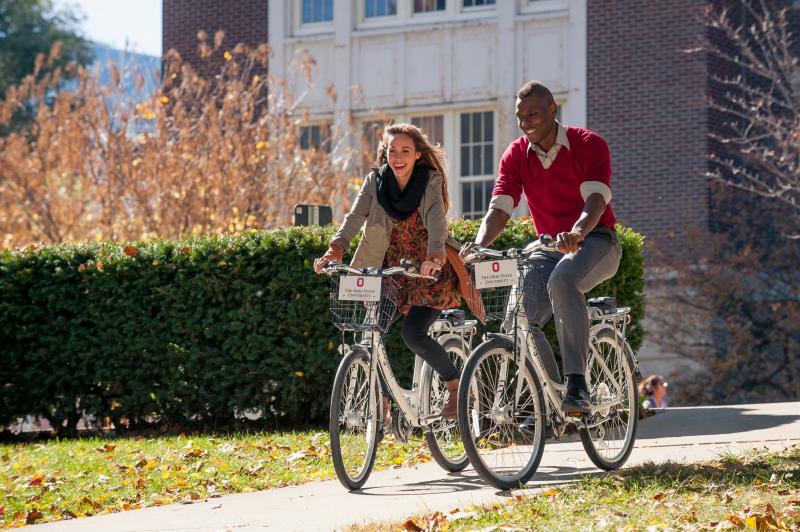 Zagster uses the award-winning Fuji Breezer for its bike sharing programs nation wide. 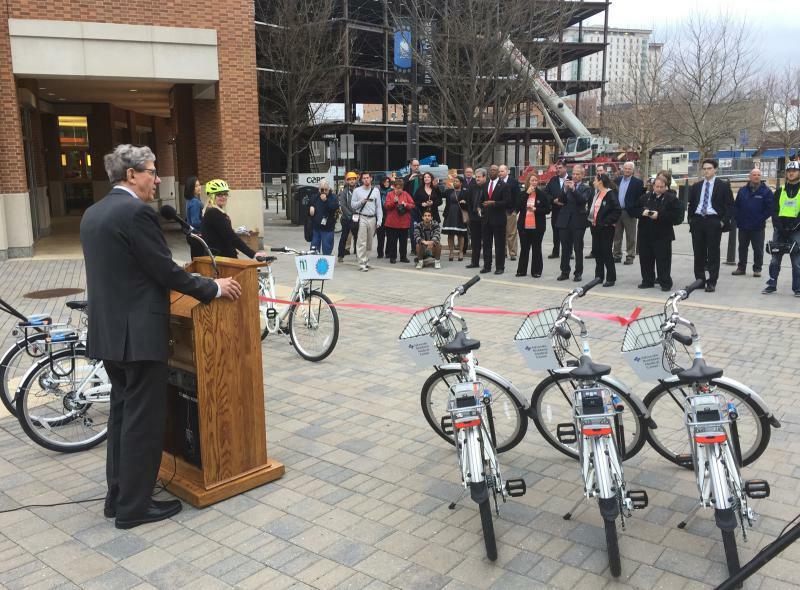 Town of Normal Mayor Chris Koos address a crowd at Gateway Plaza in Uptown during the Bike Share 309 ribbon cutting ceremony. The bike sharing program is starting with nine stations, 45 bicycles, and two adult tricycles. Racks are located near and on the Illinois State University campus, Uptown Normal, Connie Link Amphitheatre on the Constitution Trail, at Advocate BroMenn – a corporate sponsor, Illinois Wesleyan University, and Downtown Bloomington. 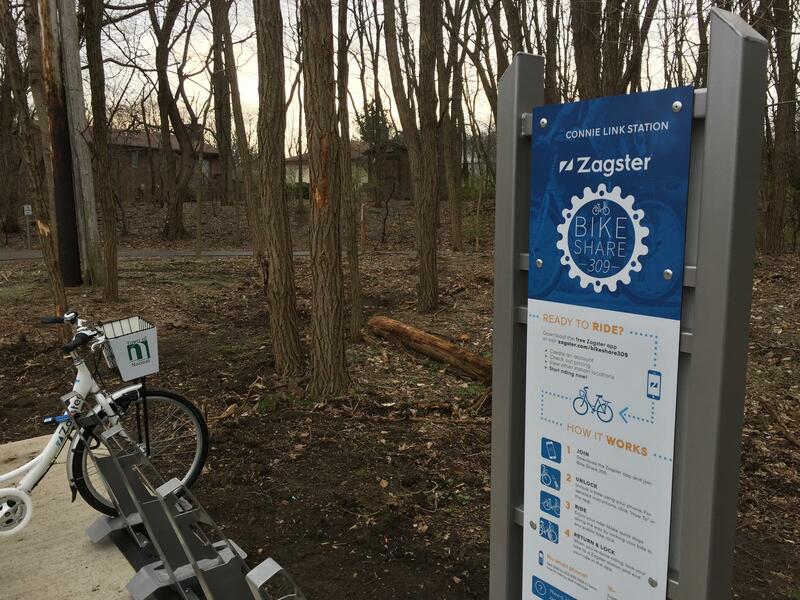 The Town is contracting with Zagster for the “turn-key system.” Bike Share 309 is costing the Town $87,000. The costs are being offset with $10,000 from sponsor Advocate Bromenn and as much as $15,000 in revenue. 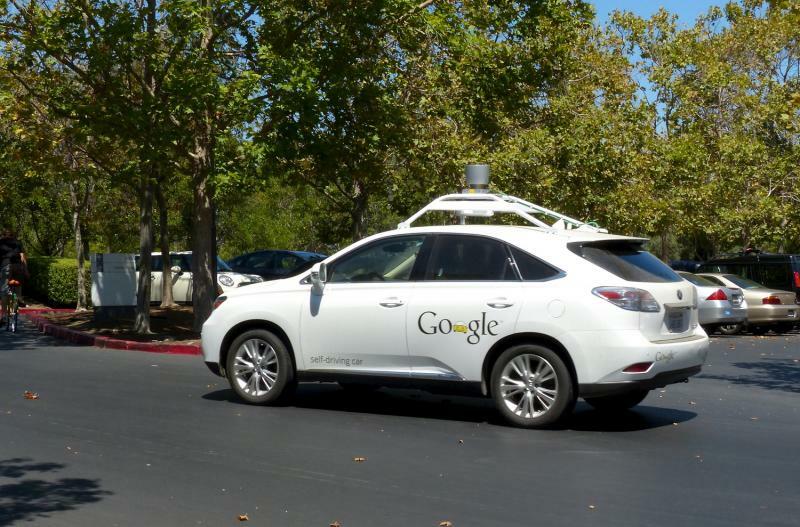 Users pay $3 per hour or get unlimited one-hour rides for a $40 dollar annual membership. Trips are booked using a smart phone app or with text messaging. Zagster Customer Service Manager Karl Alexander expects more than 100 annual members in the first year and more than 1000 trips. 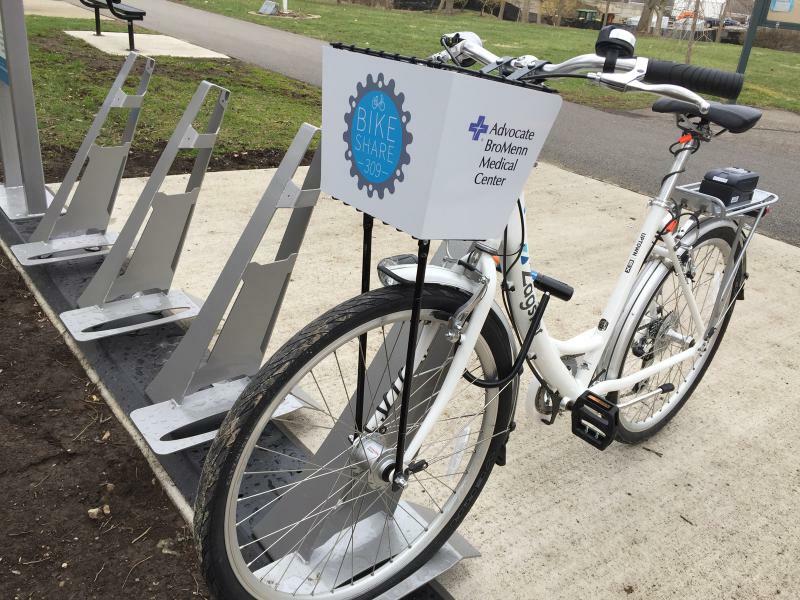 The bike share program could help with air quality or traffic congestion, but Davison said neither are a huge problem in Bloomington-Normal. The town, she said, is excited about presenting people with more transportation options. “We know people are choosing to get themselves around in different ways,” said Davison. The Town funded system will include stations on the ISU and IWU campuses, as well as in Downtown Bloomington near the Route 66 Vistor Center. Davison said the town was moving quickly to get the system up and running and did not ask the City of Bloomington to participate financially. “We do want the system to be successful though, so we knew that we needed a couple of stations that wouldn’t necessarily be in Normal. And so the two places we’re putting them are institutions we partner with anyway: Illinois Wesleyan and the Route 66 Visitor Center,” said Davison. 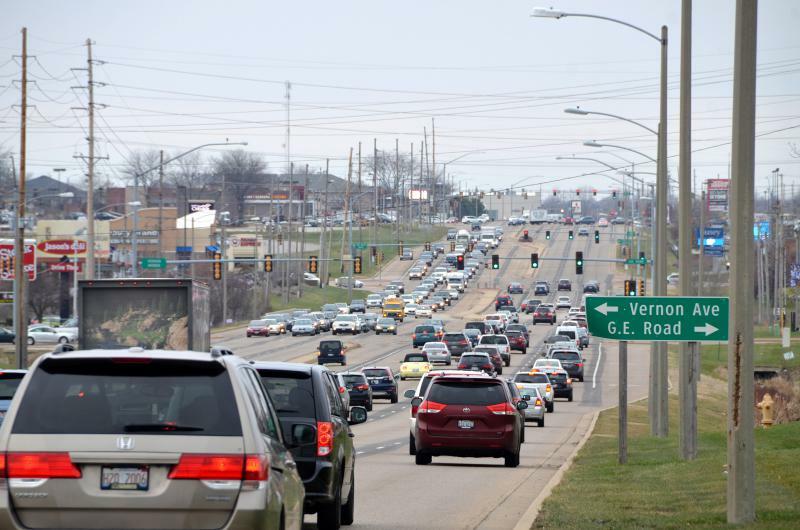 As the system becomes successful, according to Davison, more stations might be wanted or needed in Bloomington. Davison also said she hopes to bring stations to lower income and minority neighborhoods. Davison said the town worked with Zagster to help determine the size of the Bloomington-Normal system. 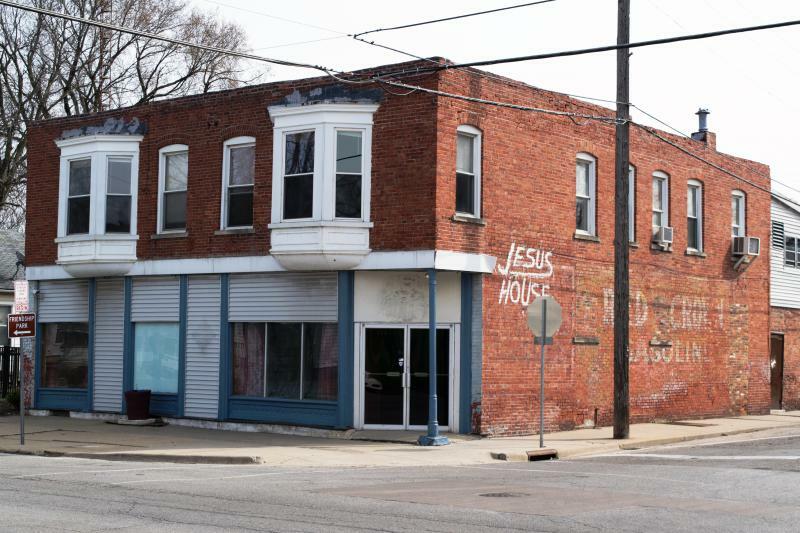 It was a balancing act between how much the Town could afford and making the sure the Town didn’t invest too little, limiting the success of the system because it would have been too small, according to Davison. 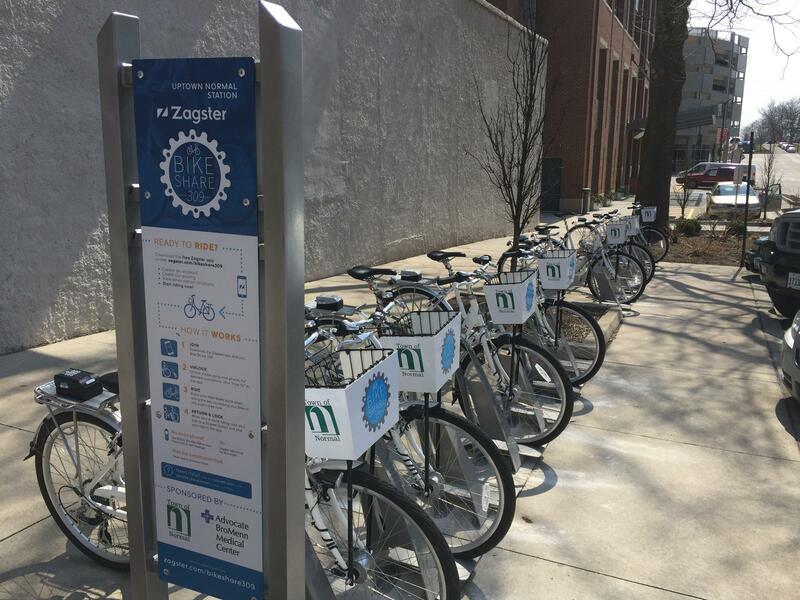 Hear the full interview with Town Planner Mercy Davison and Zagster Customer Success Rep. Karl Alexander about Bike Share 309. 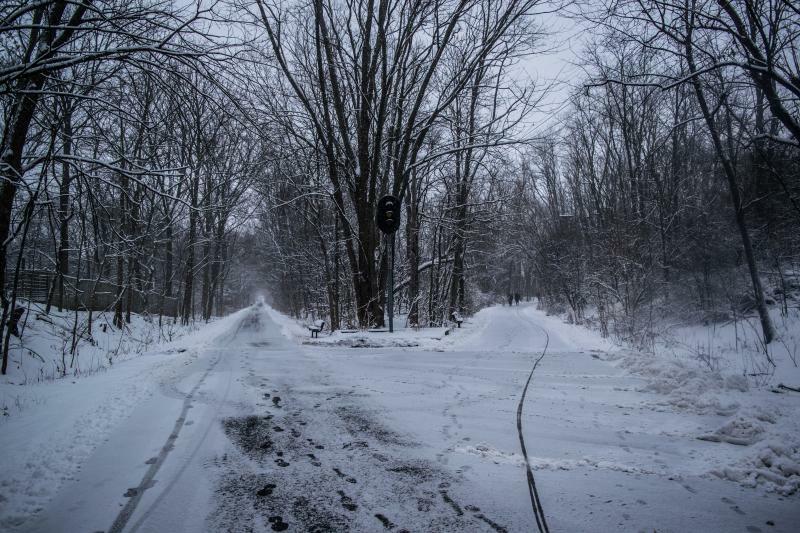 One of the most beautiful places in Bloomington-Normal during a snowfall is the Constitution Trail. The Trail consists of former converted railroad lines and other designated right of way and totals around 50 noncontiguous miles. The multi-use path turned 25 years old in 2015. All of the photos in this gallery are from the Connie Link/Allers Shelter area, commonly referred to as the "Y."